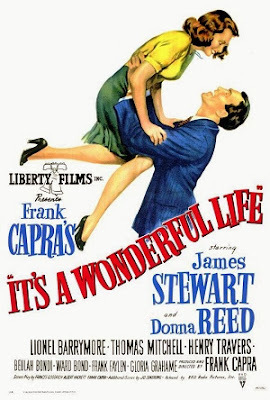 Can you believe that I saw It’s A Wonderful Life by Frank Capra for the first time only last week? The movie’s a classic, but for some reason or another, I always missed it. As there’s been a serious lack of interesting movies at the cinema lately, I decided to just catch up on some old classics I haven’t seen yet and this was at the top of my list. So, did I like it? You bet I did. 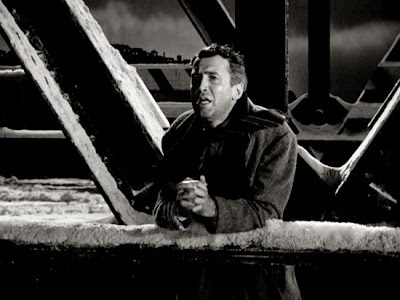 The movie centers on George Bailey, played by James Stuart. He dreams of leaving his hometown, Bedford Falls, to explore the world, but is forced to put it off because of his responsibilities to his family, his business and the poor people of his town. 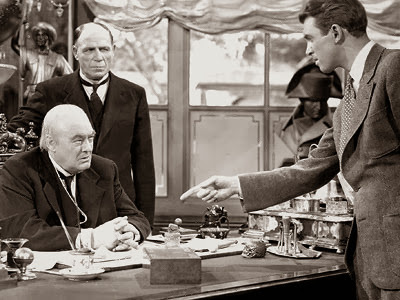 George’s family runs a savings and loans association that helps people move to better homes and prevents them from being exploited by the richest and meanest man in town, Henry F. Potter (Lionel Barrymore). 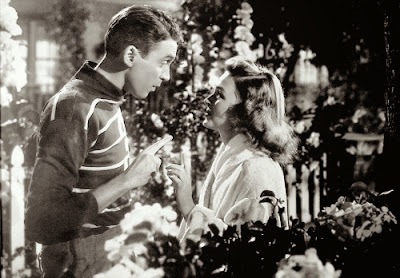 He also falls in love with a beautiful and kind woman (Mary, played by Donna Reed), marries her and starts a family. But when his uncle Bill loses a large fund for his company, George loses all hopes. He believes he’s gonna end up in jail for fraud and thinks about committing suicide. At least that way his family, thanks to his life insurance, won’t starve. Just when he’s about to end his life, a second class angel (ie one who hasn’t got his wings yet) appears to help him. 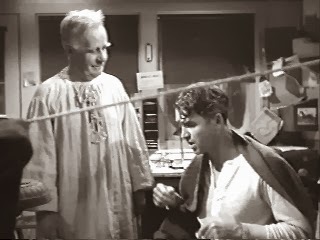 Realising the seriousness and difficulty of the task, Clarence, the angel, decides to get creative and shows George what the world would be like if he had never been born. 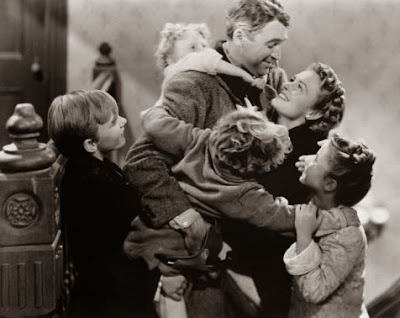 It’s A Wonderful Life is a sentimental but also dark fable. We see George trying his best to cope with one tragic event after another, until he becomes so discouraged that he starts believing he’s worth more dead than alive. Of course, there are also enough happy moments to keep the movie from ever becoming too dark, but George’s life is far from wonderful. And yet, despite all its problems and hardships, it is a lot richer than he thinks. The movie touches some important themes, like good vs evil, lost hopes and shattered dreams, the incapacity of money to buy happiness, friendship and the spirit of community. All these issues are just as relevant today as they were in 1946. We all can relate to them. But its deepest, most powerful message, and the real reason, imo, which makes this movie such an universal success, is a simple truth we often forget about: that each of us, doesn’t matter how insignificant we may think we are, can make a difference. It’s A Wonderful Life asks us the question, “What would this world be like if you had never been born?”, and forces us to answer it. It reminds us, that each one of us touches the lives of many people. With a simple gesture, a generous act or a kind word we can improve the life of others, even if we don’t realise it straight away. It’s the way we live our life, not how much money we have in our bank account or how popular we are, that determines who we are and helps make the world a better (or worse) place. The movie also reminds us that even when life doesn’t turn out the way we planned, and throws at us things that get us down, yet we are still blessed in a thousand of little ways. Ways that can not be easily quantified and can therefore seem so small we tend to overlook them. But if we stop complaining and start looking at our lives with fresh eyes, we’d realize that we are all richer than we think. 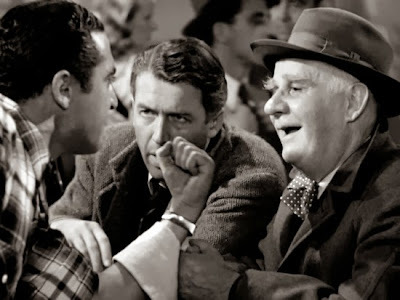 With its touching message, talented actors and inspiring plot, It’s A Wonderful Life is definitely a movie everyone should see at least once.